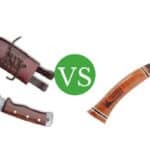 Machetes are probably some of the most commonly used blades in the world – anyone who’s had to clear bush at their farm, travel through forested expanses, or cut off unwanted branches from their hedges/trees will attest to that. You can get one on the cheap nowadays from both online and physical retailers, but it wasn’t until I had purchased them from three different retailers that I realized the importance of knowing how to sharpen a machete – the ones sold nowadays have incredibly dull edges, almost by design it seems! Now, you don’t need a razor sharp edge on a machete to start with, but even judging by that standard, most machete vendors don’t bother giving their products a cutting / chopping edge. 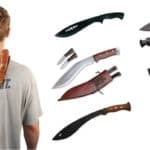 I had to go through a lot of tutorials and ask a lot of experts before I became reasonably good at sharpening my machetes – and that’s why I’ve decided to put together this detailed guide on machete sharpening to save you from the trouble I had to go through. Before proceeding further, let me reiterate that the objective with machete sharpening is not to give the tool a razor edge – for its applications, what you need is a chopping edge that can slice its way through thick bush, vines and branches. That being said, I learned from my research that machete sharpening techniques can be divided into two broad categories, based on exact sharpening application they are suitable for. You can follow any of the techniques (or a combination thereof) to get your blade honed, but I’ve developed my own favorites overtime, which I’ll share with you in detail, step-by-step. 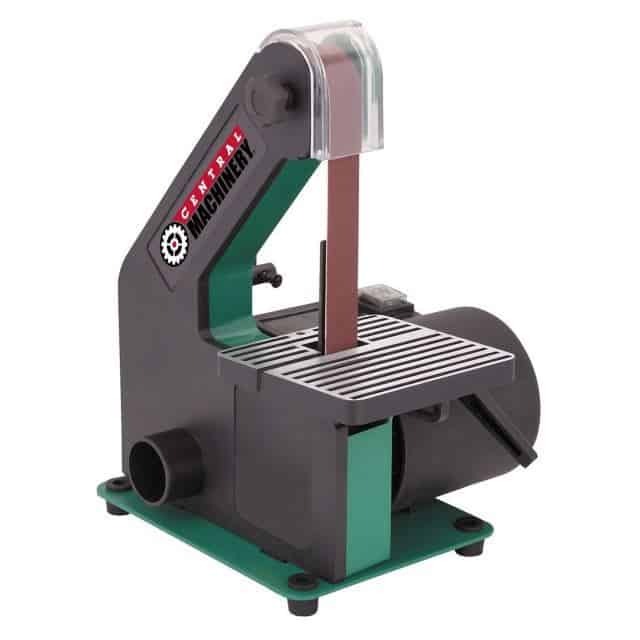 Belt sharpeners let you apply light pressure with little effort, and they’re also easier to maintain a straight edge with (as compared to grinders). Just make sure that you don’t get the blade too hot by running it across the belt repeatedly too quickly – this could damage its carbon-steel composition. Personally, a belt sander is my approach of choice for getting a new or damaged blade ready to cut and chop. 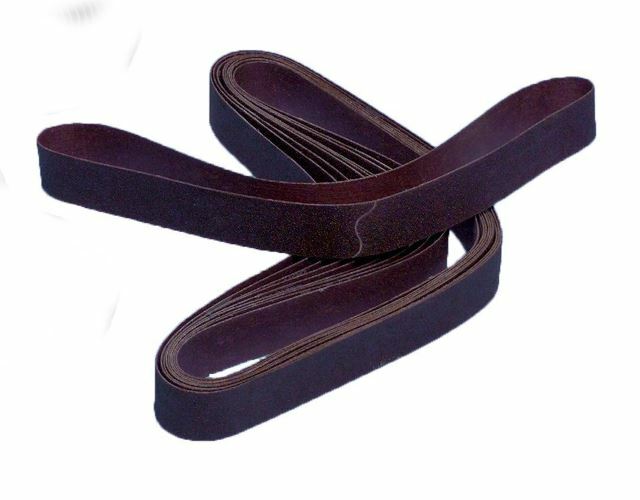 The belly of this kind of belt will allow you to give the machete a convex utility edge, thereby enhancing the overall functionality of your tool. The work area must be spacious enough to allow you to run the machete across the grinding wheel in one fluid motion, so you get an even edge. Note that grinding wheels in the higher RPM ranges can overheat the blade, which can mess with its tempering (i.e. turn it into lower grade steel) – so you’ll either need a grinder that is quite slow, or a bucket of water to constantly douse the blade in. 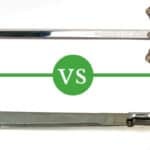 Both approaches make it considerably hard work, requiring a lot of experience with sharpening a blade, which is why it’s not my favorite approach for heavy duty sharpening. 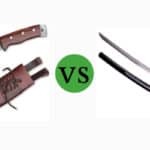 All you need to do is fix the machete into the vice (or a suitable tree if you’re in the field) at the proper angle, and push the file over the blade repeatedly – you must not pull since the file’s teeth point away from the handle. Alternately, you could you could secure the mill file and draw the blade against the tool. I don’t prefer this method since it requires a lot of hard work to be put in – you’ll have to sharpen the edge on one side by pushing from base to tip of the blade several dozen times, and then flip the blade to the other side and do it all over again. What you’ll do is simply get the dremel powered up, and run it laterally against the edge of the machete (which will be held by the vice). Remember, you’ll need to do it with both sides of the blade’s edge. The problem with this method is that it involves lateral sharpening, something that isn’t recommended because it results in an uneven edge, since you’re not sharpening the whole edge in one go. Still it’s great for removing smaller imperfections from the edge of the blade – just remember to go over it perpendicularly using a file. 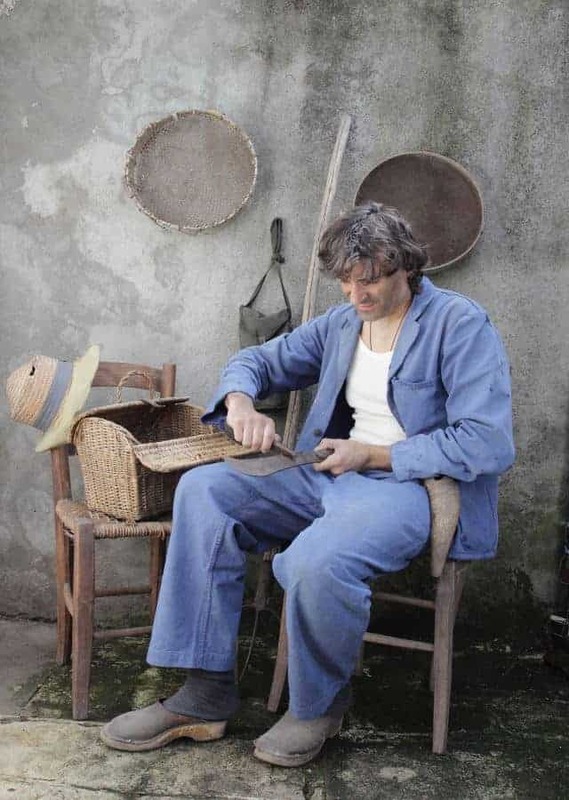 This is the traditional method of sharpening a machete, and does not require a lot of expensive hardware. Sharpening with a stone involves moving the blade from the base to the tip perpendicularly against the stone, while also moving the blade up and down the stone – this results in a net circular motion that sharpens the blade. Sharpening with a rock/whetstone is simple and doesn’t require any supplementary tools so it can be easily implemented in field conditions; while it does require some effort, it is a far more feasible approach than using a dremel. Note that you could also use a file for light maintenance, in much the same way as you would for initial edging – it would require less work when used for this application. Whetstone, wet stone, or water stone, can all refer to the same basic implement – a stone, either manmade or natural, that is used for sharpening (hence, whetting) a knife or blade. 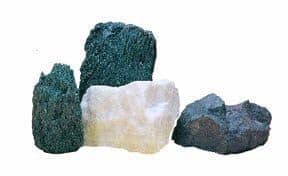 The big difference is that wet stones / water stones are a subcategory of whetstones, which also encompass other sharpening stones such as oil stones or diamond stones. The advantage with artificial water stones is that they come in precise grit sizes, however, they do tend to disintegrate over time, by virtue of their construction. After starting up the sander, run the machete from hilt to tip, in a slightly curving motion, across the belt. The curve ensures that the machete’s tip gets as sharp as the entire length of the edge. You’ll have to turn your hip to do so – lean forward a little on the side of your body that is closer to the tip, and you’ll get a perfect curving movement for sharpening the tip. Once you’ve done one side, switch the machete to your other hand (essentially flipping the blade to its other side), and repeat the whole exercise. You’ll have to do this several times (3 to 4 minutes) to get the bevel just right. Grit size is a measure of the abrasiveness of the sharpening tool, such as a file or belt. A higher grit size indicates that a product is suitable for fine and precise sharpening. 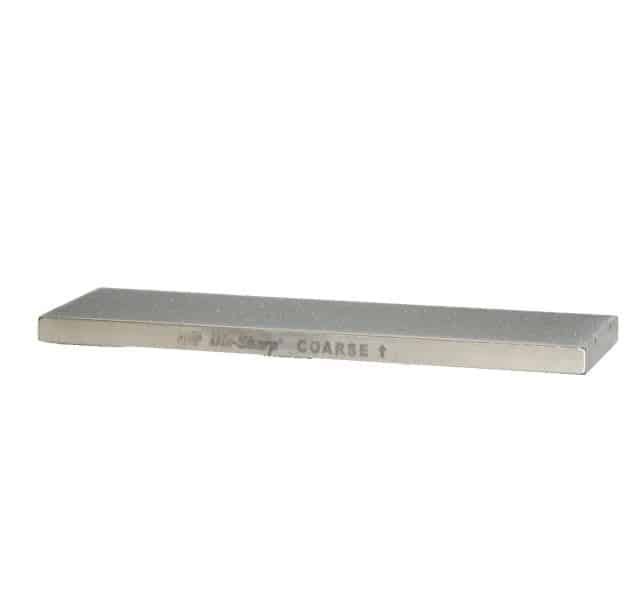 A smaller grit size will make the tool suitable for rough, inaccurate sharpening. You can save yourself some time by using a more aggressive belt e.g. an 80 grit one, but this will quickly shave a lot of metal off the edge. This is why I’d suggest that you leave this augmentation for a time when you’ve gotten more comfortable with the belt sander. Once you’ve opened the bevel up with the belt sander, it is time to add some finishing touches. A honing rod works fine for this – hold it up in one hand, and run the blade in a slight curving motion across the rod with the other, just as you would with a regular kitchen knife. Note that this isn’t necessary by any means, but if you feel that the sharpening procedure has left some impurities on the blade’s edge, you can use a buffing wheel to polish it off. 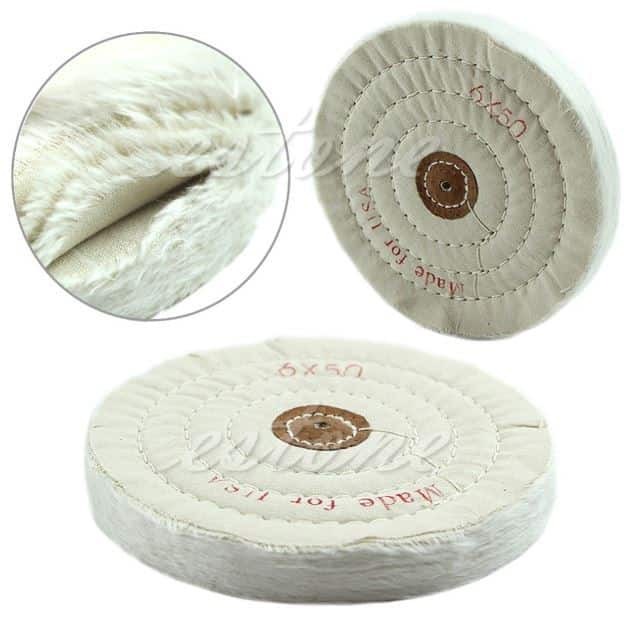 Simply place the edge flat against the buffing wheel, and move it perpendicularly across it – do this for both sides of the edge – once per side will be sufficient to give you a nice clean edge. A burr is the miniscule metal deformity resulting from over-sharpening of one side of the blade: it means that you’ve reached the apex on one side, and further sharpening has caused the edge to bend to the other side. This means you need to start sharpening from the other side now. By carefully running your fingernail against the edge, you can detect its presence. Be careful though, since it can cut! Try your newly sharpened machete on a piece of 2×4 to see if it can chop the way it is supposed to. You can also check for a burr at this stage by running a piece of paper along each side of the edge – if it makes a rough, dragging sound on either side, it indicates the presence of a burr on that side. In any case, if its performance leaves something to be desired, you can use a diamond stone to fine-tune the edge even further. 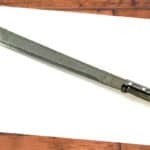 Hold the machete outwards from your body, and run the diamond stone (220 to 600 grit will do, depending on the degree of refinement you’re looking for) perpendicularly along the length of the blade, as you would do with a kitchen knife. If you plan on using an artificial whetstone, place it in a beaker of water before hand – once saturated, it will eliminate the need for constantly wetting the stone while working. In case you’ll be sharpening with a rock / stone you found on the trail, there is no need for this – simply splash some water over the stone before you start. Move the machete’s edge from base to tip along the stone, while also moving it up and down the stone. This circular motion will get some grey stuff off the stone itself, basically a mixture of tiny rocks and water, which will help with the sharpening. You’ll need to do the sliding, circular motion several times, for both edges of the blade. Run your finger down from the flat edge of the blade to the sharp edge, on both sides, to check if one side has been sharpened more than the other. If this is so, you’ll need to put some more time into the (relatively) duller side. Also check the tip of the blade, making sure that it is just as sharp as the rest of the blade, since you’ll be using the tip a lot in the field. Before I forget, when you intend to use the machete in the field to clear hedge growth, leave a few inches of the edge (starting from the base) unsharpened – otherwise, you’ll be risking cutting your knee / thigh open from an overzealous swing – take it from someone who learned the hard way! Now that you’ve read my two cents on the sharpening of machetes, I hope you will be more knowledgeable about the whole process than you were before. For more experienced readers, I do not claim this will be the best approach for everybody – in fact, some of you may have found room for improvement in my technique even as you read it: That is, after all, the nature of knife sharpening – it tends to spark passionate arguments, even among the closest of friends! In any case, what’s important is that you keep your machetes sharp and in order, and that was my intention for writing this tutorial. In fact, as you keep sharpening your skills (forgive the pun), you’ll come to the conclusion that each person’s technique has its own quirks that match their unique temperament. As always, leave your queries and remarks in the comments section and I’ll be delighted to entertain them. Don’t forget to share this guide with friends who are having a hard time using their dull new machete. Good tip on leaving a few inches dull near the handle. I nearly got my knee with an errant swing. I just picked up a Fiskers machete at Home Depot and really like the design. It was extremely dull as well. Absolutely loved your article. Im in thailand helping out some folks in the jungle and dull blades have been wearing me down. What are good qualitiea for a rock to use if you are in a pickle far from tools.